100 Personalised Iron On Labels - easy to apply, and ensures that your child wont come home with the wrong jumper or games kit, and definitely no more trips to the lost property department at school! Helly Hansen 'Aden' Jacket - a waterproof coat, with coats for both boys and girls, and in a range of different sizes - perfect for those rainy walks from the bus. School Bag - It's important to get a school bag that will cover all school day needs, this 4 piece school bag set from Head is perfect, theres a bag for every occasion, and every activity, you get a backpack, holdall, boot bag and gym bag! Personalised Address & Message Labels - great for attaching to your childrens property, books, bags, equipment etc; so if they do ever lose anything, they can be reunited with it pretty quickly. Stationery - whether it’s your favourite pop star, TV character or personalised stationery you are looking for we have it! Lunch Bag - if your child is taking packed lunches to school a lunch bag is a must have item - prevent having squashed sandwiches by lunchtime by making sure they are packed properly. Bench Black PU Strap Watch - suitable for boys and girls alike, it has a contemporary waterproof P.U. Strap, and has a light function too, there's no excuse for missing the school bus when you know what time it is. Samsung N145 Plus Netbook - perfect for homework and IT lessons, and with up to 9.7 hours of battery life, it will likely last a whole day at school! Integral 4GB USB Flash Memory Stick - handy for storing homework on, classwork, presentations etc. 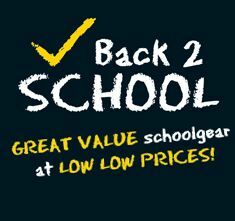 Visit our Back to School collection online now to see a wider range of items - all available to buy online now, with flexible payments. Find out more about online shopping with Studio, including personalised gift ideas for the whole family.